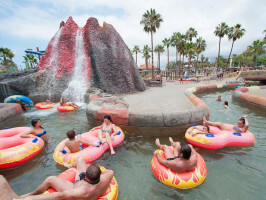 Located in Costa de Adeje in the south of Tenerife, next to the Playa de las Americas, Aqualand is a highly attractive combination of Dolphinarium and Waterpark that will appeal to visitors of all ages. The wide variety of water rides and the main attraction, the spectacular dolphin show, all make for a truly unforgettable day. At Aqualand you will be able to watch the antics of ten bottlenose dolphins, five of which were born in the park's facilities. 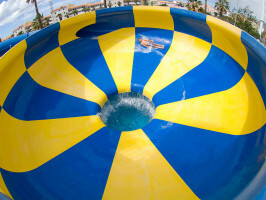 After the dolphin show, it is time to try out the great assortment of rides and attractions: the highlights are the Boomerang, the Kamikaze, Super Slalom, Twister, Anaconda, Crazy Race as well as the Mini Park for the little ones. Besides all this, the park features rapids, trampolines, a Kiddies’ Castle, Tornado, swimming pools, a lazy river (Congo River) ... and everything you could possibly ask for to spend a perfect day out for all the family. And should you fancy a bite to eat then you will be spoiled for choice. The park offers an à la carte restaurant, a self-service cafeteria, four fast food outlets, two kiosks selling sweets, soft drinks and snacks and an ice cream parlour. Get wet and wild! Enjoy the water! Enjoy Aqualand! 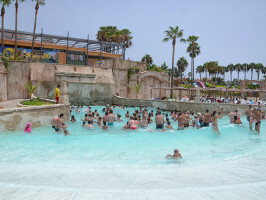 For Aqualand: aged 0-2: free admission; aged 3-4 or height between 90-110cm: Mini; aged 5-10 and 60+ or height between 111-140cm Child; aged 11-60: Adult. For combined tickets: aged 0-2: free admission; aged 3-4 or height between 90-110cm: Mini; aged 5-10 or height between 111-140cm: Child; aged 11 or over: Adult.